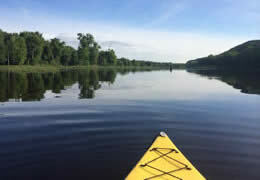 Canoe & Kayak Rental on the St. Croix River is celebrating 18 years of relaxing trips on the St. Croix National Scenic Riverway. Four different trips from St. Croix Falls to Osceola, Wild River State Park to Taylors Falls, Sunrise Landing to Taylors Falls and finally, the 40 mile Grantsburg to Taylors Falls trip. Overnight Canoe Trips from three locations on the river. Buy your trip online today! 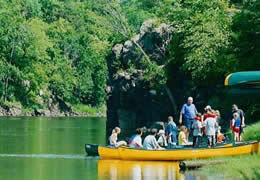 Eric’s Canoe and Kayak Rental is celebrating 16 years of relaxing trips on the St. Croix National Scenic Riverway. Eric knows the river and can help you choose the perfect trip from a simple 2 hour paddle for a “sampling” of this breathtaking river valley to a three day camping experience at any of the many FREE camping spots. If you are ready for your river adventure, simply click on the “Buy Online!” button to reserve your canoe(s) or kayak(s). Eric will have them waiting and ready for you. If you are unfamiliar with canoeing or kayaking and want some guidance give Eric a call. He is happy to answer any questions you may have. And when shopping price remember that our PRICES INCLUDE ALL SALES TAXES! 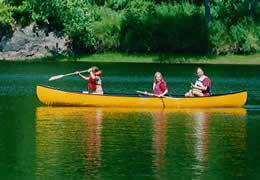 Eric’s Canoe and Kayak Rental looks forward to making your day on the river an enjoyable excursion. Don’t forget to bring your camera! See you soon. Other times of the year I also do wedding shuttles. *Departure times may be delayed during weekends or holidays. © 2019 Eric's Canoe & Kayak Rental on the St.Croix River. All Rights Reserved.